After about ten of these, I've gotten quite comfortable with the process. In the early ones, I'd arrive hours early, staking out the street, figuring out which house is 3120 Peacock Blvd. Where will I park? Will I have to carry my stuff over great distances? Does it look like the kind of house where they'll ask me to take off my shoes? Am I wearing the right kind of socks for that sort of thing? Is it possible that they are looking at me right now while my car idles in the street in front? Now, I just get directions and pull up at the appointed time. I grab my bag of stuff and stride up to the place as though I were invited - which of course I am. My interview today is with a poet I've met before. 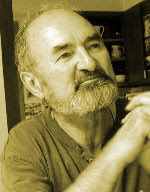 Michael Dennis Browne came to the campus of Southern Mississippi in 1985. At the time I was a boorish grad student, sure of myself, sure I was right about everything. I'd even - I'm much embarrassed to admit - developed a little phobia about contemporary poetry. Give me some Keats, but take anything from this century and get out of my way. But as I student in the program I got drafted to go to Michael's reading. It was terrific. Michael's voice, a sturdy mixture of his boyhood England and his adulthood Minnesota, worked the poems in the best way. Not caressing the words, not inflating the language, not inspiring anything into them that wasn't already there. And the poems were worth the effort it took to read and hear them. He finished with one of his more well known pieces, a gorgeous one called "Hide and Go Seek," which uses the childhood game as an extended metaphor for the growth, happiness, and safety of his nieces and nephews. The monsters of the contemporary world are mirrored by the monster the speaker plays in the waning daylight hours, and it ends with a plaintive, "All in. All in." It was simple. And it was beautiful. And I bought one of his books the next day. And today I'm going right in the house. I tell Michael about the first time we met, and we sit facing each other at the kitchen table. The house is cluttered, and I mean cluttered in the sense of full. This is a house where kids and a black lab named Jamie move around a good deal. I see an Algebra book on one table. I see a big sheet over one couch for the dog. Michael is getting lunch together for me. After hearing about my journey and its odd, vigorous schedule, he insisted I get something to eat other than "greasy road food." So he's walked to a local co-op to fetch tomato basil soup and a fine salad - with giant garbanzos in the bottom. He puts some bread in the oven as he gets the meal ready and we talk about the project. Like many of the folks I've met, Michael is envious of the trip and of the time I've got to to it. This is one thing all the poets I've met seem to share, a sort of wanderlust. New places means new ideas, new poems, new worlds. We eat at our food, talking the whole while. We look out at the back yard where Jamie has obtained - Michael doesn't know how - a big bone of some kind. I think it looks like something a dinosaur or previous tenant might have left behind, but I'm not really good with anatomy - or whatever scientific field of endeavor applies. Once we're done eating, we go out to Michael's shed, a wooden structure, literally, no bigger than 4X7. If you put 40 rolls of toilet paper in there, you wouldn't be able to close the door. But it's made for writing, not entertaining. The wood is all fence lumber. A big window opens to the southern sky, and a hand hewn desk falls out of the wall on little hinges. It's as empty as the house is full. Michael's glad to sit in it for me and I get a few pictures. It was built for $300 and it's one of a few places where Michael does his work. The other place, the dream place, is a house up in the north woods of Minnesota, a cedar house with a screened in porch and a 24' foot peak. It's instructive to tell you that Michael shows me two pictures. One of his kids. One of his cabin. We shake hands. Michael inquires about the next stop - it's Milwaukee - and once again I'm on the road.